Turning right out of my front door, I walked down to Hartington Road. 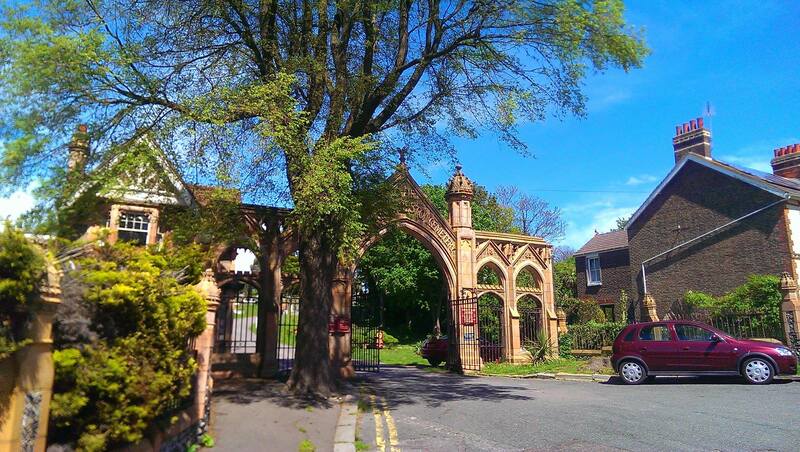 I’m too far down Totland Road to be able to see the views of Hollingbury Camp that can be admired from the top, but I consoled myself with enjoying the rather wonderfully OTT Victorian gothic entrance to “Brighton and Preston Cemetery”. Not only that, but there was a Citroen DS parked opposite at the bottom of Bernard Road. Gold in colour, which is not my favourite colour for a DS, but still rather gorgeous nevertheless. Next on the left is what I can only describe as a true work of 20th Century genius. 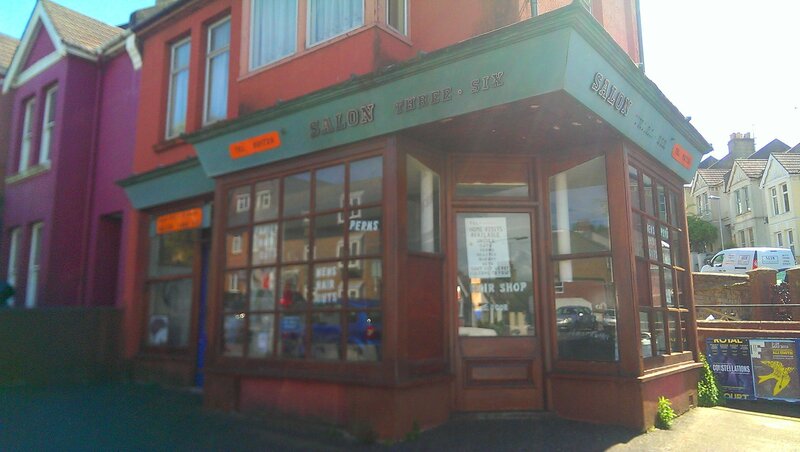 On the corner of Hartington and Whippingham Road is, possibly, the world’s shittest-looking hair salon. 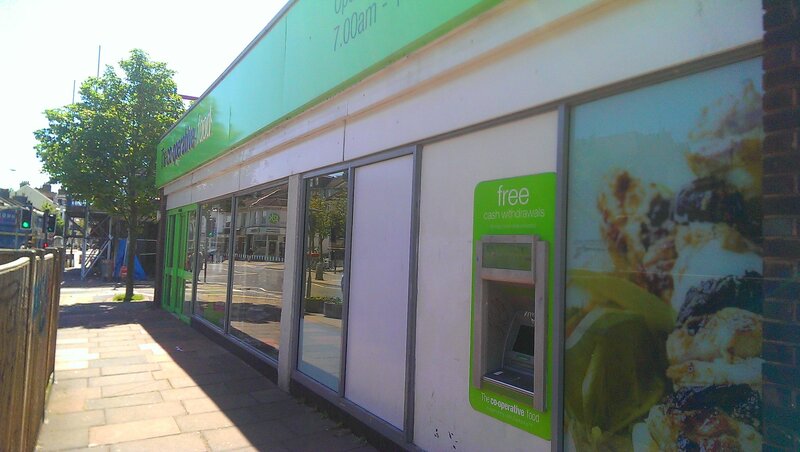 I’ve never seen it open, which is a shame, because I’d like, one day, to sample the delights of sitting in a cheap plastic chair grouped around a Calor Gas fire while I wait for someone to cut my hair who can, apparently, according to the pictures in the windows, only do styles from around 1984. At least, I’m sure Sharon from off of Eastenders had that kind of do in 1984 anyway. All is not lost, though! A sign in the door proudly claims “Can’t get here? I’ll come to you! (Saturday mornings only)”. I can barely contain myself. 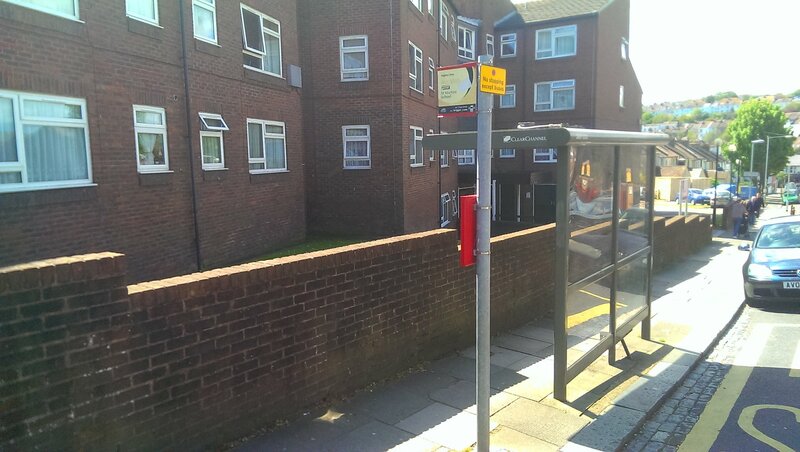 Moving on from here, the excitement only ramps up further as one approaches the bus stop where the mysterious 37b calls on its way to somewhere called Meadowview. I have not, as yet, ascertained where this mythical Meadowview may be, nor why it’s served by a Compass Bus instead of a Brighton and Hove one, but there’s always people on it. Maybe one day I shall throw caution to the wind and leap upon it shouting “TAKE ME TO THIS PARADISE THAT YOU CALL MEADOWVIEW MY GOOD SIR” which is, I believe, the way that one talks to bus drivers. Who knows what glories may lie there? It could be a whole new life. Steady yourself, though. Hold you hard, as they say in Suffolk, although in a thicker accent than I am prepared to attempt via the medium of type, especially with ladies present. We come now to the Lewes Road itself. Turn left at the aquamarine sign on the alarmingly-named “Skinner’s Funeral Home” and all of life opens up before you. There’s a Turkish shop which I’ve never been in despite a vague nagging sense that everything in there would be better and cheaper than the Co-op, but you wouldn’t get your divi, would you? Got to get your divi. Even if they didn’t bloody pay it out in 2014. If they don’t pay out in 2015, I’m bloody going in the Turkish shop and see if I don’t. Next there’s a Morrisson’s. Not the same down here as in the North, Morrisson’s. The big ones have a good fish counter, but not the small ones, no. This, of course, is a small one. AND they built it on that community garden that some hippies made happen on an old petrol station, so knickers to Morrisson’s. Eschewing that, the Co-op is next door and on your right. Bear in mind that, even if you only popped down for some onions and a loaf of bread, you will still spend at least £20. The return is an exact copy of the way there, only backwards. 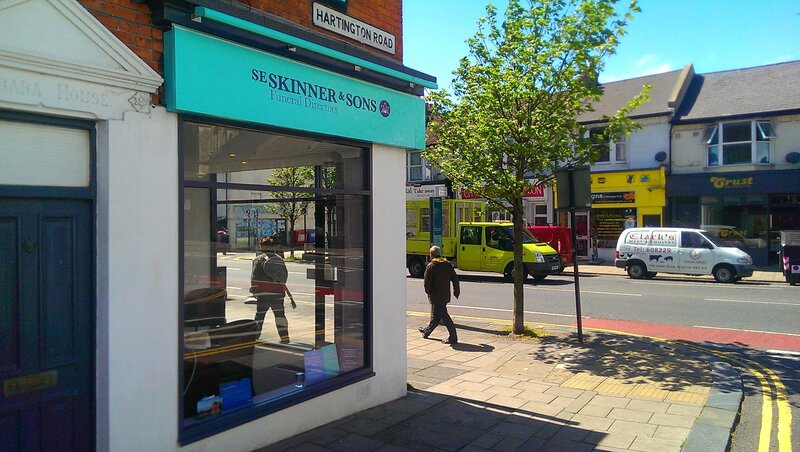 I mean, don’t *actually* try walking all the way up Hartington Road backwards or you’ll do yourself a mischief. I am starting, insofar as one ought to start somewhere, or so I am given to understand, presumably because not starting anywhere can be terribly confusing for the reader, in Lewes. It seems fitting, somehow, to start in the picturesque, anti-catholic and strangely devoid of decent tearooms, county town of East Sussex. It’s a funny old place, Lewes. Not least because of the annual catholic-burning carnage in the streets. If it’s societies, pressure groups, Guardian-reading yoghurt-knitters and local action groups you’re after, then Lewes is the place for you. It’s also the place for you should you harbour a liking for precipitous high streets, interesting looking bookshops, some quite excellent pubs, a castle I’ve been meaning to have a look at for at least five years and some really rather marvelous Downland scenery. Let’s pause a moment and have a little geological history, shall we? I can tell you are itching to know what has brought Lewes to be nestled in such an enviable position. Some considerable time ago, like even before there was BBC2. I mean really. Loads of time ago. Actual millions of years ago. The whole of Sussex, the Far North (AKA Surrey), much of The West Country (Hampshire) and the Badlands of Kent formed a large, shallow bowl filled with a lagoon, initially freshwater, then brackish, which always sounds like something Alan Bennet would say about someone “Oh, he was terribly brackish today” he might say about a man standing on a small hill in Leeds. In any case, this here lagoon was filled with tiny little fellas called coccolithophores, which is a catchy name, I’m sure you’ll agree. Coccolithophores are single-celled algae, which can produce something called coccoliths. These are single plates of calcium, which they fuse together and wrap around themselves in an exciting form of dress know as a coccolithosphere. “Phwoar, would you look at the coccolithosphere on that coccolithophore” you might hear one say to another at a coccolithophore bar. So anyway, these little calcium-covered chaps proceeded to die in their unimaginable billions and trillions and float down to the bottom of this lagoon of ours, eventually covering the clay and sand bed. Over millions of years, this covering built up to hundreds of feet thick and, under the weight of it all, became chalk. I don’t know about you, but just writing all that made my head hurt. That’s the difficult bit done, though. It gets easier from here. I’m going to make a cup of tea to celebrate. Now then (sips tea) the next thing we need to care about is the arrival of India. And I’m not just talking about the tea. Once upon a time the Indian subcontinent was a lonely, yet carefree subcontinent, drifting alone and wondering if it would ever find itself a nice continent to smack into with extraordinary force. As luck would have it, just such a continent was waiting for that very thing to happen to it. Not only did Eurasia feel it was lacking something in the pointy-triangular-bits-hanging-off-the-bottom stakes, it also knew it could do with some exciting new lumps and bumps to make Africa jealous. India provided both of these. It ploughed into Eurasia with such force that it threw up the highest mountains in the world, the Himalayas, and, like a ripple running from an enormous pebble thrown into a puddle made of billions of tons of rock, a vast dome of chalk stretching from Dorset to Champagne. Our coccoliths suddenly found themselves several hundred feet higher than they had been, enjoying the fresh air and the view and just about ready for a lovely Ice Age, or Glacial Maximum, as they like to call themselves, the snobs. At the last Glacial Maximum, the ice sheets and glaciers covered much of what was to become Britain, reaching as far south as North Finchley tube station. They would’ve come further, but they couldn’t afford a ticket to Zone 1 and glaciers don’t much like crowds of tourists anyway. Our chalk dome wasn’t covered by the ice sheet, but it was affected by vaguely filthy-sounding “peri-glacial activity”, which basically means it froze solid. Although not actually covered in ice, the ground froze in permafrost, the whole area became distinctly tundra-like, the temperatures were described as “right parky” and house-prices fell sharply, much to the dismay of the Daily Mail. Eventually, some 10,000 years ago, before even the old Queen Mum was born, may she rest in peace, the ice melted. And it melted quickly. Great rivers of melt-water surged across the land, running down to a lower area that later became the Rhine Valley and, even later, the English Channel. Such was the force of the water running over the porous chalk, that vast areas of it were washed away. The middle of this huge dome dissolved and eroded away until all but the very edges were left, the old clay and sandstones being revealed as it departed. Those edges now face each other across the Weald and are known as the North and South Downs. Let’s finish off this geological history with a reasonably swift canter across the landscape zones of Sussex, shall we? You will be astonished by how useful this information will be to you. Indeed, you will wonder how you ever got through life without a decent working knowledge of the landscape zones of Sussex. Sussex can be split up into, erm… (counts on fingers) five separate zones. A low lying alluvial plain in the south west of the county made up of deep, rich silts washed down the rivers and deposited giving rise to large numbers of market gardens and providing a platform for some of Sussex’s less pleasant towns. The South Downs which I have already explained at great length and if you can’t remember it all, then I am disappointed in you. The heavy clay soils of the Low Weald and the higher, rolling, thickly-wooded sandstones of the High Weald and finally the unnatural weirdness of the Levels in the south east of the county, land reclaimed from the sea, notably around Pevensey. It is, I am sure you are excited and even proud to learn, my intention to visit at least one tearoom or garden in each landscape zone and then write some kind of pointless diatribe about its quality and some interesting and useful facts about the landscape around it. 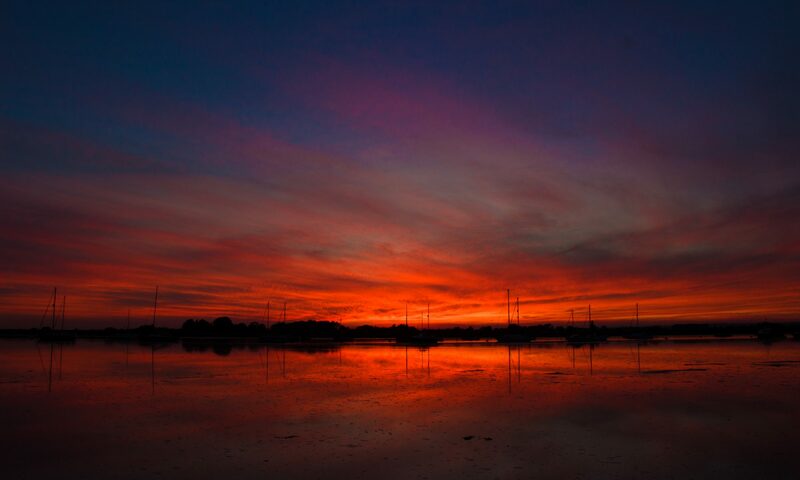 Sussex is by far the best county in the South East of England and anyone who tells you otherwise is a liar, particularly if they’re from Kent. Come with me now as I, starting with Lewes, take a jolly stroll across this incredibly varied, beautiful and beguiling landscape. To be continued, when I get round to it. In the steep hillsides above Fulking there lie deep scars, criss-crossing the landscape. 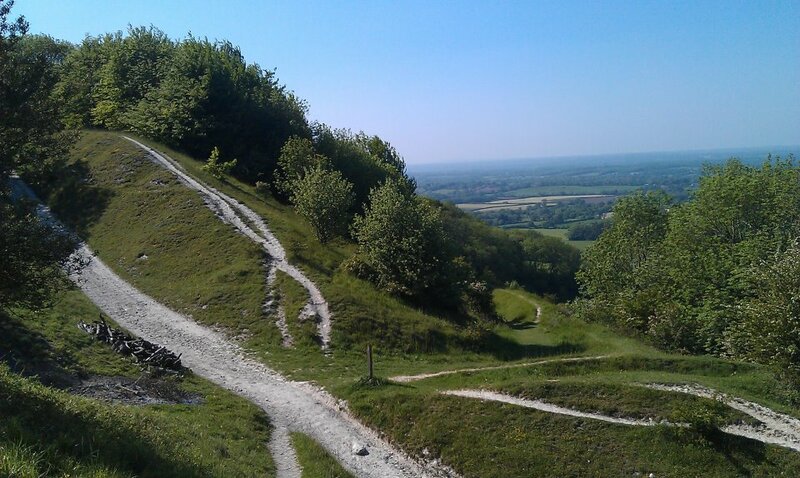 The V-shaped depressions known as bostalls are a familiar sight all along the Downs and on Fulking Escarpment in West Sussex there is a particularly spectacular collection of them, which between them tell a story of the long history of the Downs. When people first came back to what would eventually become Sussex after the end of the last Ice Age, they started clearing the forests on the top of the Downs and using them to graze sheep. Starting around 6 thousand years ago, the Downs were almost totally cleared by around 2000 BC and sheep have been grazed there ever since – reaching a peak in the 17th Century. Alongside this grazing, arable farming also grew up in Sussex. The clays of the Weald are too heavy and waterlogged to be easily cultivated, even with iron ploughs and the soils on top of the Downs were too thin and alkaline to be of any use to those early farmers. But along the bottom of the Downs, where the chalk and the clay meets and mingles, the soil is lighter and it is possible to plant crops there. To help fertilise the fields, the sheep grazing on the Downs during the day would be lead down to the arable land to spend the night, where their droppings would improve the soil. The soil of the Downs being very thin, it quickly wears away under the feet of thousands of sheep allowing rain water to run across the surface of the chalk beneath, which soon erodes to form the deep tracks we see and still walk today – some of them a thousand years old. More evidence of early farming activity on the Downs can be seen in the form of lynchets (sometimes known as strip lynchets), particularly around some of the dry valleys of the dip slope (the more gentle southerly slope of the Downs running down towards the sea). These long linear features were formed when old ploughs turned the soil, which then crept slowly down the hill, forming shelf-like platforms. Opinion is divided as to whether this was simply a side-effect of old-style ploughs – which turned soil only one way – or a deliberate act intended to better retain water on the hillsides and to provide flat terraces to be more easily worked. In some ways like a smaller cousin of the lynchets, terracettes, despite sounding like a 60s backing group (In fact, I’m thinking of starting a band called Strip Lynchet and the Terracettes, but that’s for another article), are in fact long step-like formations on the steeper parts of the scarps of the Downs, created as a result of soil-creep and the action of grazing animals walking across the face of the hillsides. 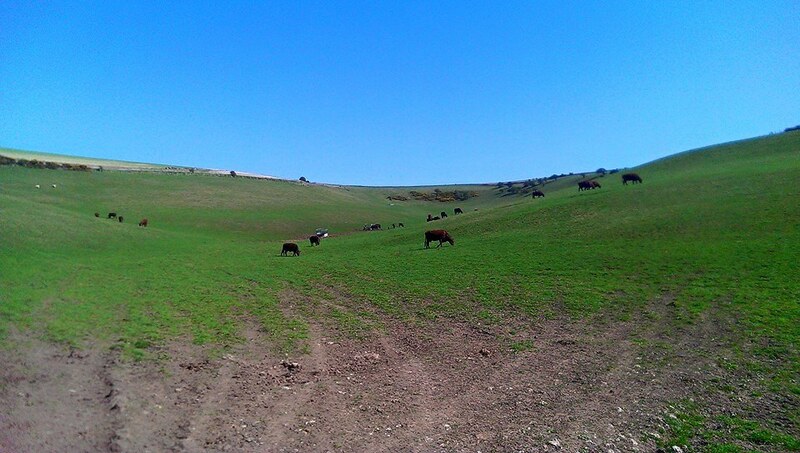 The poor, crumbly soil of the Downs (called a rendzina soil) easily washes down the hill, but collects around the base of the grass, which in turn provide a foothold for the wandering cattle and sheep. As they tend to walk along the face of the Downs, rather than directly up and down the steep slopes, they soon walk the soil into the form of terracettes. While wildlife across most of the Downs is adapted to surviving in extremely exposed situations, the numerous chalk pits provide some shelter and a range of ecological niches that would otherwise not be seen. Chalk was dug out of these pits before being baked in kilns to produce lime. The lime would then be taken into the fields below and ploughed in – both to address creeping acidification of the soil and in an attempt to make the heavier clays light enough to plough. Once a chalk pit had been abandoned, it often became a haven for wildlife, giving shelter for more delicate species and allowing scrub woodland to grow up (an unfamiliar sight on the Downs before the latter half of the 20th century), providing yet more habitats to be filled with life. Since at least Saxon times and possibly much earlier, people have got round the lack of natural water on the Downs by constructing dew ponds. The chalk being highly porous, rain water quickly soaks away, leaving nothing for sheep to drink. In order to catch and retain rainwater, these perfectly circular, saucer-shaped ponds were dug, lined with chalk and puddled clay and left to collect their essential bounty. 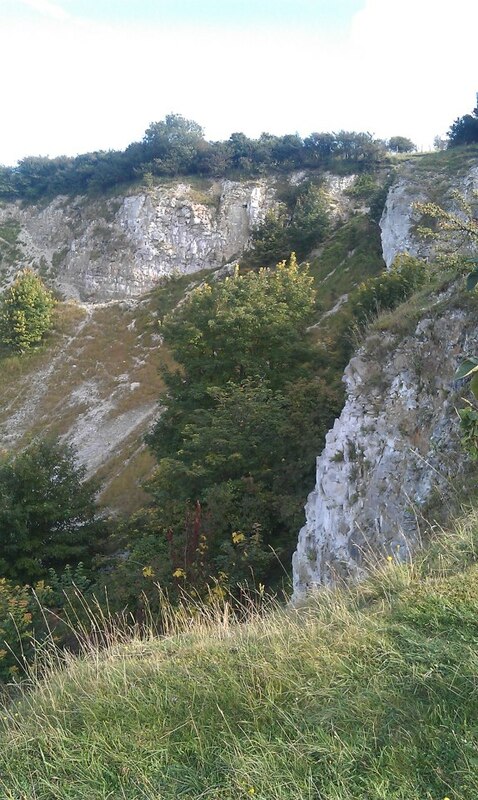 Like the chalk pits, these man-made features provide habitats that would otherwise not be available on the Downs. 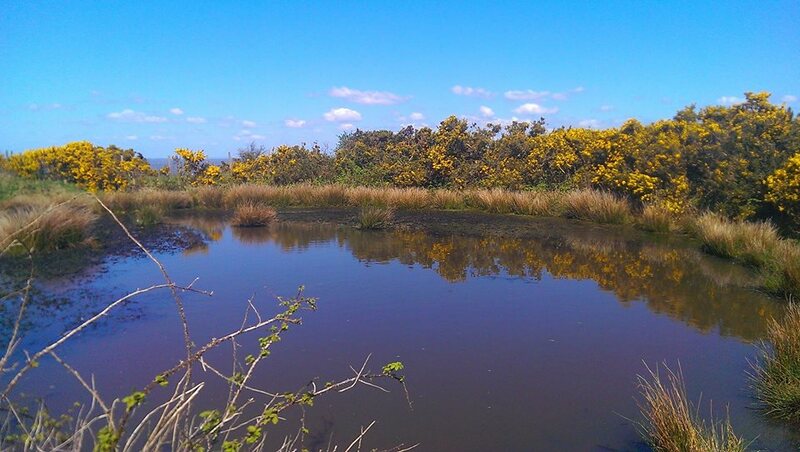 Some of the better-maintained ponds even have great-crested newts in them, despite being some distance from the next nearest stretch of water. Less common in the eastern part of the Downs, steep, wooded hillsides known as hangers proliferate as you go further west towards the Hampshire Downs. Studded with enormous, beautiful beech trees, these woodlands also contain a great deal of ash, which grows like a weed on the Downs and some of the oldest, coppiced trees of the area – small-leaved lime trees, remnants of the original forests that once covered the hills, before the coming of people and their sheep. In other parts, shepherds planted areas of coppiced hazel to provide wood for making their hurdles to control and pen the sheep during shearing. Some of the steepest slopes on the Downs are found at the top of these deep, bowl-headed dry valleys. The terracette-lined slopes were carved out by melting water at the end of the last ice-age and now provide some of the best-preserved stretches of calcareous grassland in the area, as it was impossible to plough up and “improve” them – in comparison to the flatter areas on the dip slope that were lost forever under arable fields in the 1940s, when the pressures of war required a great effort to produce more food from the landscape – made possible by modern ploughs and fertilisers. These unimproved tracts of grass, therefore, provide habitats for some of the rarest plants in the UK. Where the coombes widen out, the soil washed down from the steeper hills collects, to form deep, easily-worked and fertile soils and it was here that some of the earliest farming communities formed when humans came back to Sussex after the ice receded and the tundra which covered the Downs thawed. The Beaker People lived here before the coming of the Iron Age and the Celts, but ultimately the lack of natural water in the bottoms forced people down into the Weald, where drinkable water emerges from under the Downs and flows into the rivers. The Downs have always enjoyed a strategic importance in the wider landscape giving, as they do, commanding views over the Weald. 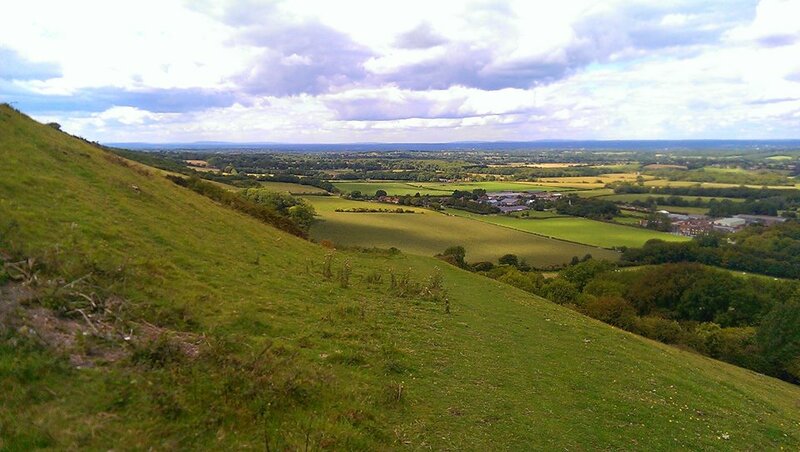 It was a powerful person who could claim control of the Downs and in prehistory they built hill forts, with gleaming-white chalk embankments that could be seen from miles away, proving that power. Long ditches known as Cross Dykes were dug to delineate borders between properties and the dead were venerated with tumuli (burial mounds) that stud the hilltops to this day. 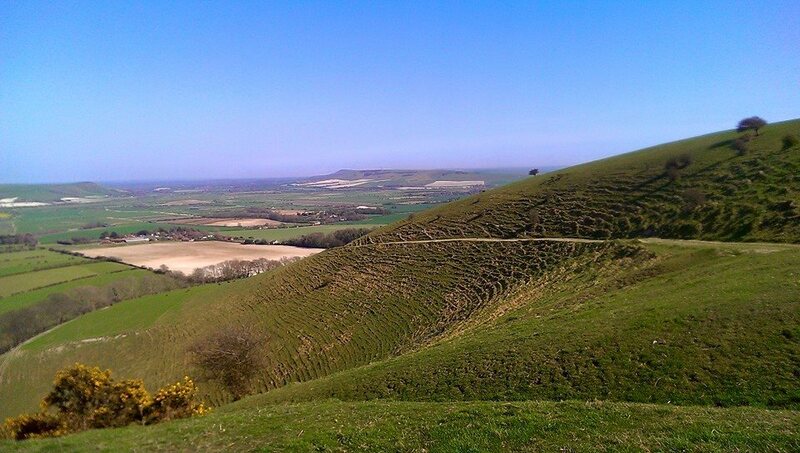 Named from the Saxon word “dûn”, which also gives us the modern word “dune”, the whale-backed rolling hills of the Downs are one of the last bastions of calcareous grassland in the UK and, indeed, in Europe. 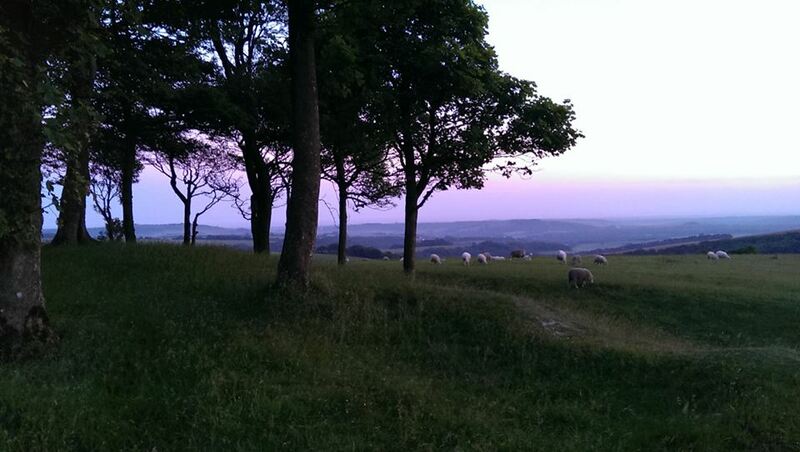 The long history of grazing on the Downs and folding the sheep on the fields below at night stripped nutrients from the poor soils, while the constant nibbling of the sheep prevented larger plants from growing. This created a unique habitat that is one of the most biodiverse in Europe. An astonishing variety of flowering herbs and rare grasses supports populations of insects from ants, whose hills cover the slopes of some Downs in great profusion to beautiful blue butterflies on the sunnier elevations and the green woodpeckers and skylarks that live on the insects. With the coming of cheap lamb from New Zealand, grazing has declined on the Downs and this unique landscape is under threat from increasing scrub woodland, destroying the herb-rich grassland. Now that the South Downs have been declared a national park, this degradation can, hopefully, be arrested, but we will never see again the Downs as they were before the coming of the plough and the ash, hawthorn and sycamore scrub that has killed some of the rarer plants forever.